Up to 6 bottles, depending on bottle size and shape, with or without intern bottles holder. Transparent and rounded top to follow sterilization. Easy to use with its unique button to start sterilization. 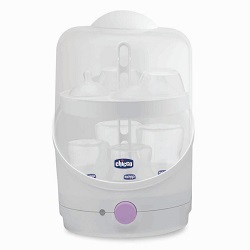 Compact but able to sterilize bottles in a 15 minutes cycle, this sterilizer rental service will enable you to behave "like at home", wherever you're staying with baby. And as for any baby equipment rental, we deliver you this sterilizer at home or at any address in Paris and anywhere in France. Mary, UK (sterilizer hire in Paris): "Just a quick email to thank you for supplying us with a sterilizer in Paris. I must say we found Paris to be a wonderful city to bring our daughter. That hotel was fantastic - hotel Victoria Palace"